This ATC Parade shoe comes in sizes 3 to 14 with the smaller sizes being vat free. 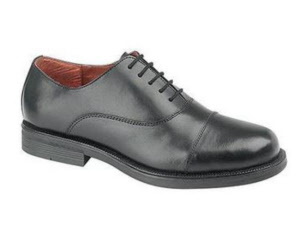 The shoes are made for cadets to use and is a low cost alternative to the more expensive models on sale.It is action leather uppers with lace up eyelets and foot bed for comfort. The can be buffed to a high shine with a bit of polish and plenty of elbow grease. Comes with non-slip sole unit. he shoe will fit nearly all cadets and you can buy it with confidence.